Residents were evacuated and boats were back in harbor in east China Tuesday, as Typhoon Maria, the eighth typhoon this year, approached the Chinese coast. Maria is forecast to bypass northern Taiwan before making landfall between Fuqing of Fujian Province and Cangnan of Zhejiang Province Wednesday morning, bringing gales, high waves and heavy rain, according to the China Meteorological Administration. Some areas in Taiwan, Fujian and Zhejiang are expected to receive precipitation of 250-350 mm in the 24 hours to 8 p.m. Wednesday. 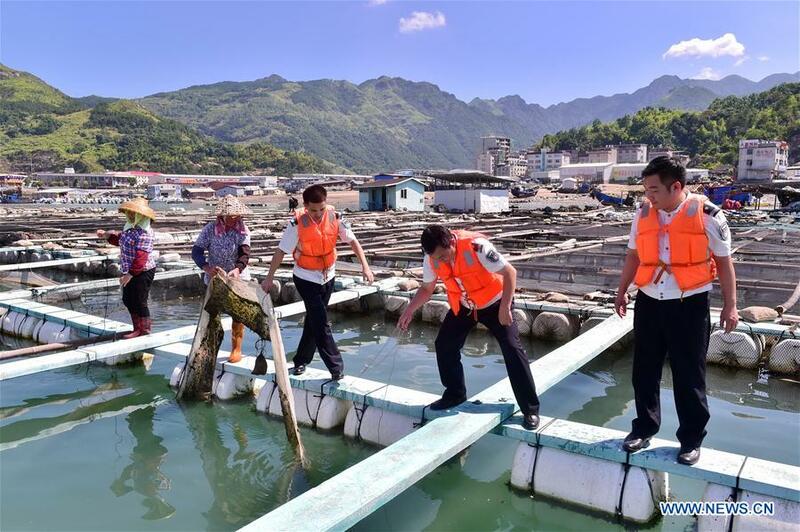 Fujian has ordered all fishing boats to return to harbor by Tuesday noon and workers at offshore fish farms were required to return to land by 6 p.m. In Fuzhou, the provincial capital of Fujian, schools and factories in coastal areas were asked to close Wednesday. Ongoing projects involving highways and ports were suspended. Eighty-six teams made up of around 1,500 workers from Fujian Expressway Group are on standby to repair damage caused by the typhoon, and firefighters are prepared for rescue missions. In neighboring Zhejiang Province, more than 144,400 people in five cities had been evacuated as of 4 p.m. Tuesday, and about 20,800 fishing boats and 4,950 other boats had returned to port or safe waters. Fourteen large and medium-sized reservoirs in Zhejiang were ordered to lower water levels Wednesday to prepare for coming floodwater. In Taizhou, Zhejiang, authorities have closed scenic areas and evacuated visitors. China Southern Airlines cancelled 38 flights to and from affected regions. As of 8 p.m. Tuesday, the eye of Typhoon Maria was 445 kilometers southeast of Ningde, Fujian, packing winds up to 180 kilometers per hour, according to China Meteorological Administration. Maria, which weakened to strong typhoon from super typhoon at 5 p.m. Tuesday, is moving northwestward about 30 kilometers per hour.